One of our most complex body organs is the human eye. All the input we receive with each of our two eyes gets automatically transmitted to the brain. It is here that the visual is processed to create and to produce – what we ultimately see. Colors, shapes, sizes, environment – imagine all this, faster than the blink of an eye. Your handy eye guide to the root causes of visual impairment, their characteristics and subsequent treatment. Also known as shortsightedness, myopia can develop in the 20’s or may also be congenital. With Myopia, objects in close proximity to the viewer can be seen with clarity as compared with objects in the distance. Dependent on the stage of Myopia, vision of objects from medium to further ranging may be affected. While the length of the eyeball may be normal, due to a false refractive index within the eye, the light rays bundle up in front of the retina rather than on it. In other cases the myopic eyeball can be too long making the light meet in front of the retina once again, causing myopia. With a simple test your ophthalmologist can diagnose myopia and rectify myopic eyesight with corrective eye glasses. Hyperopia refers to people with far-sighted vision. As compared to myopic eyesight, hyperopic vision can see further off with clarity. People with hyperopia can adjust their vision to long range by maintaining tension in the eye muscles. On the downside, this gives rise to persistent headaches and can even cause weakness in concentration. The length of the eyeball is too short as compared to a normal eye which makes the light entering the eye, meet behind the retina. Hyperopia can develop in school going children due to improper development of the eye in their growing years. Hyperopia can be corrected with appropriate corrective eyewear issued by your ophthalmologist on examination. Astigmatism causes blurred or distorted vision. Unlike Myopia or Hyperopia however, astigmatism clouds vision at any distance since it is caused by an irregularly shaped cornea. Classic symptoms of untreated astigmatism are persistent headaches and acute eye-strain. Squinting is also common with those suffering from astigmatism. After prolonged visual stimulation such as reading, watching television or working on a computer, these symptoms are commonplace. Astigmatism occurs when light fails to focus at a single point but does so at multiple points either before or beyond the retina. Astigmatism can be detected in a routine eye exam with the same instruments and techniques. The amount of astigmatism is ascertained by conducting a retinoscopy and can easily be corrected with prescription eyeglasses. Presbyopia usually occurs in the 40’s. It is a natural aging of the crystalline lens. Presbyopia sets in with age as the ocular lens gradually begins losing its elasticity. The first signs are evidence of reading difficulty with letters and characters being blurry or hazy. Objects in close proximity are the most difficult to see while objects at a further distance are easier on the eye. Reading glasses correct the vision constraints caused by presbyopia. A trip to the ophthalmologist will get you the right eyewear for viewing with ease. Also known as nyctalopia, night-blindness is a condition which makes it difficult or virtually impossible to see in low light conditions. It can also be referred to an inability to adjust or adapt to darkness. Those suffering from night-blindness not only have trouble seeing at night but also have trouble adjusting to brightly lit environs. This occurs when the rod cells situated on the retina lose the ability to respond to light. Not much can be done unfortunately if someone is afflicted with night blindness. Refractive surgery is an option but results are not guaranteed since nyctalopia is also a symptom of several eye diseases. Nyctalopia may exist from birth, caused by malnutrition i.e. deficiency of retinol or vitamin A (found in fish oils and dairy products). Contrast vision is also severely affected by nyctalopia. To test whether a person suffers from night blindness, the ophthalmologist will put drop in the patient’s eyes. This is referred to as dilation. He will then proceed to check the eyes with a slit lamp (which is an upright microscope with a mounted light). This is an effective test for diagnosis of night blindness. Color blindness or colour vision deficiency (CVD) affects men more as compared to women. For most of those afflicted with color blindness, this condition is genetic. For others, it may be due to diabetes, multiple sclerosis or they may even contract it over time because of aging or certain medication. Color blind people can see just as clearly as anyone, however their perception of the colors red, blue and green is compromised. Most color blind people cannot differentiate between these colors primarily. The effects of color vision deficiency may be mild, moderate or acute. In fact about 40% of colour blind students aren’t even aware that they suffer from it. Traffic signals become an issue and in some extreme cases the entire colour spectrum may be perceived alternatively. For those with acquired colour deficiency, if the cause is established, once treated the vision can return to normal. Some people find coloured glasses or lenses helpful while others do not. Genetic colour blindness though has no cure to date. 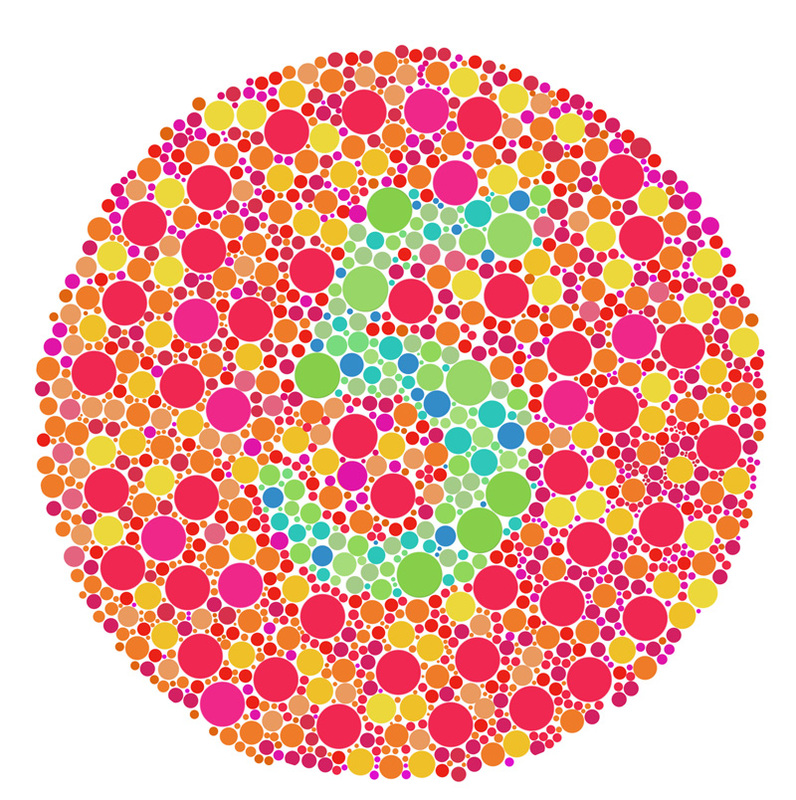 Since there are different types of colour blindness, the comprehensive Ishihara color perception test judges the type of color blindness prevalent in someone who is color blind. The test consists of a number of plates where the Ishihara colour plates consist of circles populated with a number of random dots of size and color. The dots are colored in and so arranged to form a number. Each plate has a different color arrangement which indicates a different colour impairment is prevalent. A person with normal vision can clearly see the number in the plates. The complete test consists of 38 plates. Once the ophthalmologist gauges the specific type of colour anomaly, he then proceeds to perform an eye test using an anomaloscope. So, do you need an ophthalmologist? Now that you understand just how vision related issues can crop up, you can get around to checking your vision. With different test methods available, it really comes down to a matter of personal preference. The eye is an extremely complex organ and yet the most fragile. Which is why our eyes need proper attention and care. For a thorough approach towards discerning eye impairments or complications, a visit to the ophthalmologist comes highly recommended. You’d be amazed at how something as simple as prescription eyewear can change your life around and it begins with a simple vision test. Every single input we receive, is transmitted to the brain in the form of light where it is interpreted by the brain on formation. The muscles in the eye go on to adjust the curvature of the crystalline lens to the required visual depth in order to focus. Either by expanding or contracting, when the crystalline lens adjusts itself to focus, the process is referred to as accommodation. If the image created through accommodation of the ocular lens is formed on the retina then one can proudly say they have perfect vision. However if there is any flaw in this functioning then what we get in return are blurry or hazy images. Because of its inability to adjust, the image is created either in front of or behind the retina rather than on it. These hazy images are a result of the brain and eye muscle fighting against each other to create an image rather than working together in tandem. Constant migraines or the feeling of pressure behind the eyes are two tell-tale signs of a vision problem. The most common visual test used by ophthalmologists is a manual one which checks each eye separately. The specialist usually holds up cards at a set distance from the patient. It begins with single letters which the patient is then made to read out which steadily decrease in size with every subsequent line. The more lines read out correctly then the better the vision. If not? Read on for more on eye related ailments and testing.